Here’s Mark sporting his mum’s black wedding-day lingerie which she gave him on his 16th birthday as a “Coming-of-Age, Becoming-a-Woman” present. He wears it, with nothing else, whenever he’s at home... is honoured to wear the lingerie that his mum got married in... looks forward to the day he can wear it under a frilly bridal gown when he is made wife to a good-woman.His 3 sisters are jealous that he got mum’s wedding-lingerie, but he is the eldest daughter after-all... & does look the most prettiest in it! 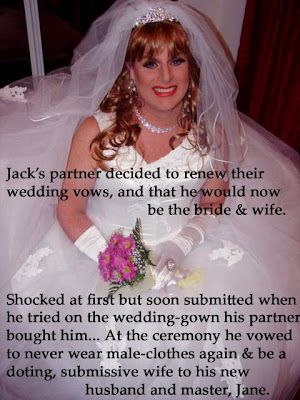 Jack’s partner decided to renew their wedding vows, and that he would now be the bride and her wife from then on. Shocked at first - but soon submitted when he tried on the wedding-gown his partner had bought him... At the ceremony he vowed to never wear male-clothes again - and be a doting, submissive sissy-wife to his new husband & master, Jane. After he’s served them dinner he does the washing-up as the women retire to the drawing-room, smoke cigars and discuss the proposed amendment to the Equalities Bill - and all agree it should be Law that all men dress en-femme at all times. Here’s David on his way to his 2nd date with Juliet, who he met on the web. Their first date went fantastically and she asked him to wear the same outfit again as she was greatly turned on by him in it, especially his legs! They’re going out to a fancy dance-club... she’ll be wearing a tuxedo, and plans to treat him as the Princess he is. David has now started dressing en-femme more & more since their first date... feels more confident in a dress - feels like a Real Man. He has started to throw out his trousers and plans to ask Juliet to tell him what clothes he should go out and buy. Here’s Jack in his favourite outfit... his black french maid’s uniform... which he must always wear whilst doing his chores. His husband, Jane, insists the house be immaculate when she comes home from work.